Today in Masonic History Oscar Kelly Allen, Sr. is born in 1882. Oscar Kelly Allen, Sr. was an American politician. Allen was born in Winn Parish, Louisiana. He attended local schools and would go on to attend Springfield Normal School and Business College in Springfield, Missouri. He also attended Trinity University in Texas. In 1898, Allen beame a school teacher in Winn Parish and various locations in Texas. In 1908, he became the assistant registrar at Trinity University. In 1916, Allen began his work in public life. He was elected tax assessor for Winn Parish, serving until 1920. From 1924 to 1927 he served as the clerk for the Winn Parish Police Jury, a group of elected officials who administer the county government. In 1928, Allen was elected to the Louisiana State Senate. He became closely associated with Governor Huey Long who was swept into the governors office that same year in a landslide victory. 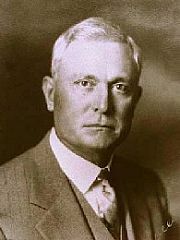 Long appointed Allen to the Louisiana Highway Commission until 1930, when the Louisiana Supreme Court ruled it unconstitutional serve in legislative and executive position at the same time. Allen was elected governor in 1932 after Long was elected to the United States Senate. Many considered Allen's time as governor as a "puppet ruler" for Long. A political enemy of Allen once joked that a leaf once blew into the Allen's office and Allen signed it into law because he thought that it came from Long. During his time as governor, Allen signed into law Louisiana's popular homestead exemption, which prevents property, at the time of death, from being taken for taxes or creditors from the remaining spouse. Allen passed away from a brain hemorrhage on January 28th, 1936. At the time of his passing he was the Democratic nominee to replace Long in the United States Senate after he had been assassinated. Allen was a member of Eastern Star Lodge No. 151 in Winnfield, Louisiana.